Hyperanchor is the next generation of bookmarks. You can make hyperanchors for any element of a webpage (sentence, image, table, etc...), and put it into the old bookmark menu by using HYPER-ANCHOR. When you use HYPER-ANCHOR from the menu, you can easily return to the element. This means that you don't need to search the position of the element in web page, because HYPER-ANCHOR leads you to the position by scrolling and informs you of the element by your chosen method of indication. right click on the selected text and select HYPER-ANCHOR from the context menu. right click on images, tables and select HYPER-ANCHOR from the context menu. 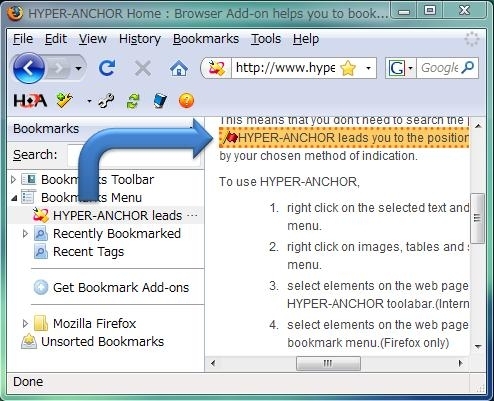 select elements on the web page and push the Bookmark button on the HYPER-ANCHOR toolabar. Registered hyperanchors as the bookmark can be used as URL character string. So it is embeddable as the hyperlink in web pages. It is useful that HYPER-ANCHOR set the default title of bookmark same as selected text. Copyright© 2008, BITS Co., Ltd. & Prof. Okubo. All Rights Reserved.